← Salt, Government, Doctors and People! Brand Name versus Generic Drugs. Are You in Danger of Clueless Doctors? Posted on July 18, 2014	by Angela A Stanton, Ph.D. It seems to me that most everyone hates high drug prices (me too) so everyone heads toward generic the moment it is available. But we are facing problems with that. We all know that many of the generic drugs are manufactured in places without US standards and though the FDA and pharmaceuticals swear that they are safe and equivalent, there have been exceptions to that and lawsuits followed. However, here I want to evaluate if doctors and the FDA understand chemical structure and if they are looking at that to see if the generic is a true equivalent to a brand name in active ingredients. This blog is about the danger of your doctors not understanding the chemical structure of the medicines they prescribe, so cannot catch if there is a difference between a generic or a brand name. They do not (cannot) compare if the chemicals will be able to do the same in the generic as in the brand name in your body. Surely we know that we can fool our bodies and eat rubber thinking it is sugar. If it is sweet and looks like sugar, we will think we eat sugar but we may still die at the end of the day from eating a chemically different food from what we thought we ate. This is definitely true in the case of food–just look at the history of several artificial sweeteners. So what about generic drugs? Do they have the same chemical structure as the brand name? And most importantly should they? What is a generic versus a brand name? That is what I want to discuss and want to guide you through one particular drug that I bumped into and nearly got killed by. The brand name of the drug in question here is Singulair and unless you fall into the 1% of asthmatics for whom this is a life saver, you probably have never heard of it. Think of it as an environmental protection against asthma. I have asthma and I happen to be in this 1% so the chemical structure is important to me and it should be important to my doctor. It is important to note that many more asthmatics take Singulair than they need to. To test if you need it, stop taking it for a couple of days. If your asthma does not change (provided your environment does not change) you are in the 99% who do not need this medicine. The generic name of a drug represents the name of the key ingredient(s) in the drug–by law. So for example, Advil is Ibuprofen since that is the key ingredient in both. There are generics for many drugs but of course brand name drugs have patent block for 20 years so until then, companies who manufacture generics do what is called “backward engineering.” Backward engineering takes the drug, looks at the patent information that contains just enough information to know what the end product looks like. They then chemically untangle and try to rebuild to have similar behavior in the generic drug to the brand name with the same active ingredients–also by law. Not being equal to a brand name is fine as long as the name of the generic reflects the difference. Most do. Take Singulair. The main ingredient in the brand name is Montelukast Sodium. Generic medications providing the same are all called Montelukast Sodium and they come dime a dozen. But someone up or down in the food chain of drugs decided that oh.. sodium is not important… and dropped it and came out with a generic called Montelukast. Montelukast is not Montelukast Sodium, as the name depicts. In fact, the generic manufacturers honestly state that by showing even the chemical differences–mind you this is already against the law. The law clearly states that the active ingredients in a generic must match that of the brand name 100% and only the inactive ingredients can be different (source). As you can see on the top right it has Na+ at the end–Na+ is sodium ion that will ensure it will attach to the proper receptors in the body. It is positively charged so it seeks out a negatively charged ion, in this case you see COO– there. 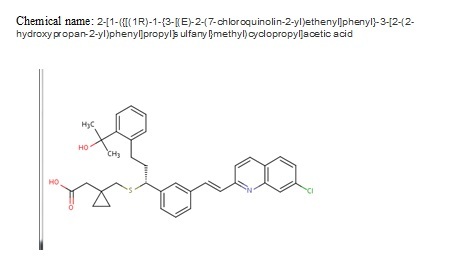 This combination is important in the metabolism of the brand name drug–or generic drugs with the same chemical signature. It is not listed but the molecular weight is 582 so way less than Montelukast Sodium that is 608.18. Note how cleverly, wherever you see this chemical chain, it is always up-side-down – relative to how the Montelucast Sodium chemical chain is drawn. Why may that be? Could it be to deliberately take the eye off of the importance that instead of COO–Na+ we now have HO and O ? Plus many other changes! Oopsy! We have a big problem here! Not only is the sodium missing but also the chemical chain is broken in a different place in a different way and Molenkulast Sodium has H2C whereas Molenkulast has CH3 instead and an HO appears in that triangle in a different place. These have important indications in the human body! Perhaps the best way to put this is imitation crab versus the real crab: it may look like it and may even taste like it but the chemistry of the imitation crab is nothing like the chemistry of the real thing. AMENDMENT on 8-26-2016: Since 2 doctors have commented below stating that the two molecules are identical (doctors Steve and Angela Grant), I would like to clarify in the article itself that the two molecules are completely different–my responses are written in the comments but to make it clearer, I add them here as well. Dr. Steve suggested that the two molecules are the same because 1) the human body is always full of sodium so if the molecule needs a sodium it will pick it up and 2) as the molecule rotates in real life, taken in another view or angle the two are the same. So let me address his concerns since he is wrong on both accounts. Yes indeed, the body is always full of sodium. And as Dr. Steve correctly points out, in the body everything breaks down into ionic form and so he suggests–based on the molecule being able to pick up sodium from the body–that the sodium we have in the body is not already tied down by something else. That is chemically impossible since sodium (Na+) is an ion and as such, it will do everything possible to become a complete molecule and grab anything that has a negative ionic charge since sodium ion is positive (missing an electron). Exception to this are the ionic channels (all of our cells have many) in which case the function of the ions is to remain ionic and generate electricity taking advantage of the ionic charge differences. Sodium is unstable as ion and most certainly cannot await the arrival of a medicine. All sodium ions are already tied down in the body doing some tasks–or are to remain ions to conduct electricity. Most sodium is used as part of our electrolyte and as such it is used by our body to maintain hydration and to clear toxins out of the body. Furthermore, what Dr. Steve suggests assumes that a molecule–such as Montelukast–can pick up ions. A molecule is a stable form and it resists any changes to its structure. Thus as it disintegrates in the body into ionic components, it will perhaps pick up whatever else it can but at that point it is no longer Montalukast but its different ions, none of which necessarily will attract a sodium ion. In medicine, assumptions made are often dangerous guesses. Montelukast’s chemical formula is C35H36ClNO3S with molecular weight of 586.184 whereas Montelukast Sodium’s chemical formula is C35H35CINNaO3S with molecular weight of 608.18. As chemical equations, the rotation of the molecule no longer matters since it is a mathematical equation in which the left side of the equation must be the same as the right side. So let’s put them side by side and you decide: C35H36ClNO3S ?=? C35H35CINNaO3S Are they the same molecules? Not even close. Dr. Angela Grant first suggested that since the body has “a lot Salt in the form of NaCl [sodium chloride]. I imagine Montelukast will pick up the Na+ regardless because of [its] strong affinity and our organs bathe in a pool rich with NaCl and other ionic compounds”. I provided answers to this in my response to Steve in point 1 above but this comment also assumes that NaCl remains NaCl in the body, in molecular form that is. NaCl is pure salt molecule that is stable and does not have the propensity to break up into ions unless it is forced to do so. The assumption that NaCl remains NaCl in our body ignores the metabolic chemical changes of anything that enters our body–though apparently this doctor was a chemistry major and is also a medical doctor. I wonder if NaCl stays as is, how on earth do we generate voltage that requires positive and negative ions on the two sides of all cellular membranes? Without NaCl breaking up into Na+ and Cl– to generate action potential, we have no cellular voltage at all. Action potential is when Na+ moves into the cell as Cl– remains on the outside of the membrane. Resting potential is when the positively charged potassium ions K+ flow into the cells as Na+ leave. Without ionic movement there is no life. Thus making the assumption that molecules don’t break up into ions is not understanding biochemistry and human physiology. Dr. Angela Grant also took the ingredient list of Singulair and Montelukast: “Each 10-mg film-coated SINGULAIR tablet contains 10.4 mg montelukast sodium, which is equivalent to 10 mg of montelukast...” lol… not sure on what planet is 10.4 mg of something equivalent to 10 mg of something but not on planet earth, as far as I can tell, that is an F- in math. However, she also states that we all are different and respond to medications differently and thus what may seriously affect my health may not affect yours. Totally true. However, when it comes to a medicine that is a standardized formula, there is no such allowance that a generic drug having a different active ingredient from the brand name is permissible because some people are different. Now you would think that a head doctor at a very famous and prestigious medical institution would check for such chemical differences before prescribing Montelukast instead of Montelukast Sodium to an asthmatic, whose ability to breathe may, in fact, be compromised by the generic drug! If you visit the Wikipedia and look for Singulair, you will get Montelukast and though I had a big fight with them, they refuse to see its significance since they say that on the FDA website the two, meaning Montelukast and Montelukast Sodium are the same–but that is actually not true. It is cheaper to produce Montelukast than Montelukast Sodium and thus medical facilities will pay less. I noted earlier that only 1% of the asthmatics benefit from the drug. Many get it who do not benefit. So for them it makes no difference if it is Montelukast or Montelukast Sodium since neither would work anyway. Thus there is no way to check, except in those rare cases, like mine, where it matters, if the generic as Montelukast works equivalently to the brand name that is Montelukast Sodium. This muddies the importance of getting the correct chemical formula! Thus the answer is clear; those of us for whom the real stuff would work end up getting the fake stuff that will get us sick. This is not unique; it happens all the time to others as well. What makes it unique is that this time I was able to identify the difference and rest assured they will not get away with it without either changing to the real stuff or making the news as the bad guys. One of the two will happen! Their choice! This is also a warning for you all out there who read this post! Our medical system has deteriorated to the point where we as patients must be better knowledgeable about our illnesses than our doctors are! It is time for us (you too!) to start taking a giant magnifying glass to all medications we take and compare ingredients and look at chemical charts. You don’t need to know what the chemical stuff means; you just need to see if they look alike! I would like to add to this article some important information. Today I called Merk, the pharmaceutical company that manufactures Singulair. They confirmed that indeed, Montelukast is not equivalent to Montelukast Sodium and the active ingredient in Singulair is indeed Montelukast Sodium. 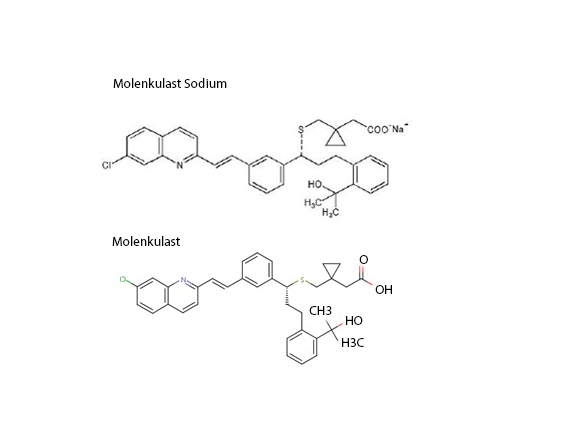 I recommended they check the postings on Wikipedia on Montelukast and also on the NIH website (I linked here only one article but there are many more) because these articles are incorrect and wrongly represent Merk’s great product Singulair, which is Montelukast Sodium. It also gets people like me sick, since Montelukast does not have the necessary ingredient of Montelukast Sodium–in other words, Montelukast Sodium is one molecule. It is not equivalent for me to take Montelukast and a pinch of salt. Nope. I thought I update you since now the assault on all fronts of the wrong information is on and my medical company better provide me with the correct drug! I was also given the brand name medicine by my medical provider, resolving my problem. This entry was posted in Interesting reading, Must Read, This & That, Thoughts and tagged bad drug, brand, cheap, chemical, chemical chain, chemical equation, clueless doctor, doctor, doesn't work, drugs, generic, generic versus brand, imitation, lazy doctor. Bookmark the permalink. 39 Responses to Brand Name versus Generic Drugs. Are You in Danger of Clueless Doctors? Oooohhhh that’s a lot of money. No, I didn’t need to look for an alternative because after this case, my healthcare provider gave it to me free for several years–now on Medicare it is not free but acceptable. However, I know that you can get this brand name from regular drugstores and also Costco as brand name for about $600–at least that is what it cost last time I checked. Are you in the US? You can also contact the manufacturer (Merk) and ask for assistance. They have some program that helps people who cannot afford the brand name. Hi Angela, I just read your very informative article! I have experienced problems with using generic vs brand name Singulair. I was never diagnosed with asthma or allergies until I moved to southern Indiana in my 50’s and started developing horrible bronchitis which lasted 6 weeks each fall. It took a few years for me to figure it all out because I worked as a school based therapist and just thought I was exposed to germs all the time so of course I’d get sick. Finally, noticed that my symptoms seemed to coincide with the corn harvest. I lived in a rural, farming community and clouds of corn dust in the fall is common. After that discovery, my doctor put me on Singular and it felt like a miracle when I wasn’t sick and miserable that fall. I took it for several years until following a change in my insurance carrier and the new the pharmacy sent me generic. Since I successfully use other generic meds, I didn’t give it a second thought until I got bronchitis again in the fall. To make a long story shorter, I have battled with insurance companies and even a pharmacist who insisted it was identical medication and suggested my reaction was all in my head! I really have not thought that was the case because I truly am open to using generic medication when it is as effective, and I certainly would prefer paying for the generic rather than the exorbitant price of the brand name!! Until I read your article I didn’t understand why I reacted the way I did but now it makes sense, (even though I don’t totally understand all the chemistry involved). Thank you so much for your wonderful explanation. I would love to find out if those of us who fall into the category of needing the brand name have any avenues available to making this medication more affordable or if any reasonable, effective alternatives become available? BTW, my sister has had the exact same reaction I have had although our brother is able to get relief from his symptoms from the generic. Very sorry to hear this happened to you too. In terms of what you can do, I would contact Merk–the brand name manufacturer–and ask for their help. That is what I did. I also contacted the FDA though they probably didn’t get involved. But Merk can help you establish if the generic you take is different (well we know it is but we need details) and how. If your insurance company doesn’t agree with helping you, Merk may be able to help financially if you qualify–they can also put the pressure on. If a generic fails to live up to the standards of the brand name, and you can prove that in court, you can start a suit against your insurer, because at that point they hold you to a drug THEY too know doesn’t work for you and makes you sick. That is a crime. My insurer has the policy that if the generic fails, they provide the brand name at a somewhat reduced cost so while more expensive than the generic, it is still reasonable. In terms of the corn fields though, I have an additional recommendation to you. You and your sister are allergic to corn–and likely to other grains as well. Grains–even those without gluten–can be dangerous for many people. In this article: https://www.hormonesmatter.com/gluten-free-is-that-enough/ I explain where gluten comes from and what its parent protein is that you are sensitive to. Corn is a grass, just like wheat, filled with “prolamins,” the protein you are getting bronchitis from at corn harvest time. I started to get asthma in 1994, right after the Northridge Earthquake in California–I lived in the middle of the affected area and lost my house in it as well–since it kicked up a dust cloud containing dormant parasites. These killed 26 people later. In my case it just brought on asthma–or so I thought!! Then I changed diet 5 years ago because of my migraines, and a little over 3 years ago I went grain free! By “grain free” understand all grains, including corn, rice, oats, flax, in addition to the ones everyone knows are grain like wheat, rye, barley, etc. Within 6 months, a host of health conditions started to just disappear–including allergies. I now have NO allergies at all and stopped taking all allergy medicines over a year ago. I am now over 3 years grain free and my asthma is lifting as well! What is more important is that if there is the slightest grain in anything, I get an asthma cough! So the grains were driving my asthma though it may have been initiated by the parasites in the earthquake dust. I will never know. By now I have quit all asthma medications, only Singulair is left, and an occasional puff of the maintenance inhaler (Q-Var) as I am quitting it very slowly. I am considering test-tapering off of Singulair to see if I am ready to come off of that as well. The reason why I wrote my story is for you to see that we often end up with symptoms that we associate with one thing that turns out to be caused by an entirely different thing. Years of allergy medications were taken by me yet now I know that it was grains I was allergic to, and because my immune system was fighting all grains all the time, my allergy to grains manifested in ways–like asthma, arthritis, rosacea, a host of GI issues, and even insulin resistance. By the way, I never tested allergic to any grain via blood allergy test, so save your money on that one. All of these (and more) went away when I quit grains. I recommend you look at your condition as a grain allergy and see how your condition improves when you quit grains for at least 6 months. Don’t cheat, since from each small serving of grain, it takes 3 months to recover from even for a healthy body, since it can cause major havoc with the immune system. So give it a true 6 months and see how you feel. this is strange… it sounds like I have a condition similar to yours. I have asthma/allergies, which I believe are the result of having worked in an environment with a lot of diesel exhaust and package dust. It was a UPS distribution center. After about 8 months of working there I started to develop chest tightness and a throat clearing sensation (post nasal drip). I saw a number of doctors but none of them were able to diagnose me correctly. Eventually I ended up seeing an allergist and he put me on Singulair… at the time I had good insurance and was taking the brand name for a number of years. But having to quit UPS, I got a job with a lesser insurance and had to convert to the generic. I could tell the difference between the brand name and generic version. While on the generic I started to feel nauseous and my stomach would bother me. I tried a number of different manufacturers thinking each would be different. But I continued to experience similar type symptoms. Eventually I realized I could still buy the brand name Singulair but it would cost about $100/month. I was willing to pay the extra amount in order not to have those unpleasant side effects. But then just a few months ago it went from $100 to $200/month, which seems too expensive so I decided to try a generic brand again. Today is actually my first day of trying the generic brand from the manufacturer Sandoz. And sure enough my stomach has been bothering me more today already. I don’t think I can just imagine it so I’m pretty sure this isn’t in my head. I’m just wondering if it takes some getting used to since I was on the brand version for so long. I don’t know how long anyone would want to stay on a medication that adds a symptom to an already annoying problem like allergies/asthma. I’ve tried everywhere looking for a cheaper version of Singulair and have tried all those various coupons but none of them bring down the cost. And mail-order Mexican pharmacies I don’t trust although they advertise the brand name for $50/month. The Canadian mail-order pharmacies require a prescription and when I mentioned this to my doctor he would said he couldn’t write a script for a Canadian pharmacy. I even called Merck but I don’t qualify for their Patient Assistance Program since I barely make over the maximum amount to qualify although I live in a high-priced region. So at this point I’m not really sure what to do. On top of using the Singulair to help control my asthma symptoms I do weekly immunotherapy shots. I find the combination of the medication on the shots give me the most relief. I usually feel symptom free for about 4 to 6 days and then the chest tightness returns. And as a result of the chest tightness = lung inflammation I’m prone to more respiratory illnesses. Whenever the wind picks up I end up feeling it in my throat and lungs. It is frustrating having to deal with this sort of chronic illness and not being able to get the right medication at an affordable price makes it even more frustrating. I’m constantly checking the internet for new and alternative forms of treatments. And at times I’ll read about a promising study or a cure… but I don’t know how far out all that is. And I’m not sure Big Pharma would ever want allergies or asthma cured with a single pill or shot. The market is growing at a rapid pace with all the environmental pollutants and the Global Warming that is effecting many millions of people. But I’m still hopeful that they’ll be a better treatment in the not so distance future. I agree. It is a very hard choice. I did something though that significantly lessened my asthma and allergies–though now I am on the brand name Singulair still and I hope I can stay on that for life. however, I found that quitting grains was the best thing I have ever done in my life. I don;t mean just gluten but all grains. It appears that, for some people, grains cause major problems. I never thought of myself as a celiac but after I quit a total coincidence happened as I decided to get the 23andMe genetic testing and one of the things I got a notice on is that I have a high likelihood of being a celiac and I should take that note to my doctors. I found that to be an interesting coincidence. I now have been grains free for over 2 years and my asthma has reduced tremendously–I used to end up in the ER twice a month and now I have not been near one (nor my doctors) for over 2 years. Thank you for your response. I never actually considered a link between grains and allergies/asthma. If you have any literature on it, I would be interested in reading up on it. Although my medical knowledge and vocabulary is certainly limited so I am not sure if I can understand complex medical journals. But I have wondered if people that show a certain reaction to certain foods are also more prone to allergies/asthma. In my case, I don’t have an allergic reaction to cilantro but there is a certain aversion to it that I’ve always had. So sometimes I wonder if there are food reactions that may portend an immunological disorder, which I believe allergies/asthma is. I have always wanted to try one of those DNA testing services like 23andMe to see what it might reveal. And now that are more services on the market it has definitely become more affordable to where I will probably end up doing it. Maybe they’ll be some information that can possibly lead to a better treatment plan with my allergies/asthma. Also if you happen to know of any Clinical Studies being done with any kind of alternative treatments other than the usual new inhaled corticosteroid, I am always willing to try something new. I also happen to be in the Southern California area and have signed up for the Clinical Connection mailing list for any updates on their studies. But I would welcome any new information that can somehow help me overcome this problem. As I hope others are also able to overcome what ails them. I recommend you read the book that got me off grains as well: “Wheat Belly Total Health: The Ultimate Grain-Free Health and Weight-Loss Life Plan Hardcover” – September 16, 2014 by William Davis MD. This book not only illuminates the connection between grains and asthma, but between grains and about 50 other health conditions. While I didn’t have all the health condition he refers to, I did have some of them and they all also vanished. My asthma is still there but minor and my allergies are gone. An awesome inexpensive little book. Sure. I had a 3-months battle with the generic before we realized what was happening. I suddenly got my asthma back at emergency level, hacked and coughed up phlegm all day long, lost my voice (yeah.. that was awful because they needed to check my voice cords thinking something happened to them so they went through my nose with the tube with a camera)… I also was extremely tired and started to fall into depression because it felt like I was dying (and I was). I went through a TON of tests to see what suddenly happened. I also lost my appetite. The pulmonary tried everything: changed my inhalers, put me on a nebulizer, put me through lung CT scan with contrast, you name the test, I had the test; you name the asthma drug and I was to try that drug. Nothing worked when I ran out of my 3-months supply of the generic and found 2 pills of the old brand name in a bottle that was in the back of my drawer… I just took one and all my symptoms disappeared by the next day. It was really amazing. I hope you can fight your battle too but make sure the pill bottle only lists Montelukast as active ingredient before you fight this way. If it says Montelukast Sodium but you still see changes in your son, it can be from the coating. The brand name is coated such that it dissolves in the intestines and not in the stomach. If that coating is missing, and the drug dissolves in the stomach, it also isn’t equivalent to the brand name in full but it need not be. The coating falls under the inactive ingredients and so that battle needs to be fought by it not working. There you cannot use my argument since the FDA allows for a difference in the coating so that is a harder battle. Greatly appreciate your scientific explanation and concern. I have used original singulair medication several years ago and had a good experience while taking this medication. Recently was on montelukast for maintenance until I have a total knee replacement surgery and had a horrible episode of insomnia and had a shut down the day after. My question is if their could be a difference between original singular and generic montelukast medication side effects. My primary health care doctor thought It could not be what I was saying until he looked up the side effects in a web page and told me to discontinue the medication ( which I did without his opinion). Hate this generic medication montelukast. Probable in the future will purchase original singulair medication to check out it’s difference and verify if it does not have the same side effect as generic medication montelukast 10mg. Sorry to hear how Montelukast also hurt you like me. My reaction was different but then we all respond differently. I hope you can use my write-up on the chemical difference to help you get the brand name. I would recommend you contact Merk too. They are very nice to deal with and will help you get the brand name. My medical institution switched me back to the brand name and I am now getting it free as a result of my effort albeit that may not last too long as I enter the Medicare age soon. 😦 Yet to see what happens. But this was such an important medicine for my asthma at that time that it was important. However, I noted that my asthma, though is always there now minimally, was actually caused by (or at least exacerbated by) grains! I don;t mean gluten but grains! Since I quite all grains, my asthma is almost non-existent. I now can tell if there is grain in something or not by getting an “asthma cough” and that tells me that my asthma is really grain induced. Therefore, I started reducing all my asthma medicines and am already half on my inhaler. The last step will be to come off Singulair to see if I still need it. Hopefully the answer to that will be “no” and it will no longer affect me. Thank you for your advise concerning grains withdrawal from my diet. I will keep in mind your advise. I am already in that medicare range and probably will have some problems with the manufacturer. Greatly appreciated your scientific research about the difference in between original singulair and generic montulekast. I will see how I struggle with my allergic asthma condition, since the inhalers my doctors have prescribed make my throat really dry. Dorca, which inhaler did you get? I found the powder type (like Advair) to be also very difficult but the one I now use (Q-Var) doesn’t dry my throat. I wish you the best of luck with quitting grains! I personally quit all and also all sugar types (I don’t take sugar substitutes either) and have reversed all my illnesses. I no longer take medicines other than Singulair and half the dose of Q-Var. I keep on reducing. What is amazing is how much difference diet makes to your health! My doctor has prescribed the correct medication- the insurance refuses to pay for it. Will Merck discount? Or has this been part of your fight? I have severe EIA so needless to say, serious workouts no longer exist for me. If you find, like I did, that the generic has a completely different chemical formulation from the brand name–you can ask Merk to verify!–then you have the right. In fact it is an FDA regulation that the generic must be completely identical in its active formulation to the generic or it is illegal. I don;t know but I believe (based on TV commercials) that all pharmaceutical companies have a program where they will help you with the cost of medicine if you cannot pay for the brand name. The only way to tell is by calling them and asking them. I just would use a search engine to get their phone number (which is what I did) and call them. A tablet that contains 10.4 mg of montelukast sodium by weight contains only 10 mg of montelukast BY WEIGHT. Get it? Take away the sodium and it literally weighs less. Imagine that. Just curious………..what is your PhD in? Precisely Dee… so the two are not the same drugs since one is missing sodium. It makes no difference what my PhD is in; in fact one need not have a PhD to see that if one drug weighs 10 mg and another 10.4, the molecular equivalence required by law for identical active ingredient is missing… read the whole story to understand it please–perhaps you need a PhD? I am another ‘clueless doctor’ Sorry Angela but you’re knowledge of basic chemistry is not up to writing this article. All drugs that are swallowed are dissolved before they are absorbed. The molecules you have shown dissociate into ions in the gut. Montelukast is the acid and Montelukast Na is the salt. Therefore the Montelukast ion in solution is the same for both preparations. Given the huge amount of Sodium in your body versus the tiny amount in the tablet; there is no way that the molecule has a special relationship with its own sodium atom. In terms of the methyl group and the hydroxyl group being in a different place, this remember is a 3 dimensional molecule that rotates freely at each attachment. It is not a flat molecule. Both drawings are in reality identical. Yes they are the same. I would take this post down as it is misleading and pandering to hypochondriacs. Remember 2% of the world is mad, allergy and madness make close bedfellows. I appreciate your calling yourself a “clueless doctor”, which you obviously are not, since you dare reading my posts–clueless doctors get pissed rather than try to provide constructive criticism, like you have. I truly appreciate your getting involved and trying to point out a different view. I understand what you are saying in terms of chemistry but unfortunately that is not how this drug works in the body. The clear proof of that is the generic formula of the active ingredients, which has to be identical to the brand name in its active ingredients. The key term here: active ingredients. This is so by law. Montelukast and Montelukast Sodium are very different chemical molecules in how they work in an organic matter (though might be the same in the vacuum of chemistry) where they attach differently with the sodium handle on or off (which does not separate in the intestines, since it is chemically bonded to separate elsewhere). I have contacted Merk, the manufacturer of the product (they manufacture both brand name and generic) and their formula for the generic is Montelukast Sodium. It is registered that way with the FDA as Montelukast Sodium. You can find the original label here. 1) The salt in the body is waiting to be used and is not already being used in ionic form as part of the electrolyte, operation the voltage gates sodium-potassuim pumps and sodium channels. It is not about to remove itself from a cell just to pair up with a montelukast molecule. It is taken and is not free. Montelukast Sodium: C35H35CINNaO3S with 608.18 molecular weight. Can they be the same even closely? Nope!! That molecular weight difference is huge and the chemical formula is very different. So you propose that C35H36ClNO3S = C35H35CINNaO3S ??? Really? On what planet? As Montelukast, it is only 90% bioequivalent to Montelukast Sodium–see here. The 10% that is missing, for those to whom Singulair actually makes a difference, is huge. It is important to note that only about 1% of asthmatics actually benefit from Singulair though many are prescribed it. If the 99% stop the medicine for a week, nothing will change. I know many of them and they clearly fall into the 99% for whom whether they take Montelukast Sodium or Montelukast makes no difference because neither is necessary for them. 4) felt sicker than a dog. 5) I went through many medical examinations that were not asthma related since my voice went away! I thought something happened to my vocal cords and voice box so had the gross test of the tube through my nose down to my vocal cords and after 3 months of just about getting ready to die, I ran out of Montelukast and found 2 more pills in my old Singulair bottle so I took one while I reordered. The very next day all my problems were gone. This is not a placebo effect since I had no idea that I was not actually taking Singulair when I took Montelukast! It was a “double blind clinical trial of one person” if you will with two different drugs that are marketed as the same by many as a result of a typo by a scientist in an academic journal from Asia and getting away with it as a result of sloppy reviewers! In conducting my research contacting Merk, the FDA, my healthcare provider, and even many pharmacies, I discovered that the Montelukast sold as a generic equivalent in not a generic equivalent at all–this by several sources, including Merk and the FDA, although the FDA also has pages on which the two are confused as a result of that one article, the FDA admits they are not the same! An additional factor of importance with respect to your comment about “dissociate into ions in the intestines” that is not noticed by many but I noticed and specifically asked Merk about it. The original Merk-made Singulair has a special coating on the tablet to protect its dissociation into ions in the stomach. The generic pill I was given was not coated with anything and likely dissociated in the stomach, in which case the sodium ends up in a different place from where it is intended. As a result, the brand name and properly coated generic equivalents all have to have the same coating type in order to pass through the stomach acids without being destroyed. It is likely that the generic I received suffered both the wrong molecular formula and the wrong inactive ingredient coating. Whatever the case may be, if I don’t accidentally bump into an original brand name pill, I may not be here today talking to you! Thanks for caring and I truly appreciate constructive and educational discussions with worthy doctors–you obviously are one. I took Singulair and it was awesome. When the generic came out it didn’t work at all but at the same time it didn’t make me sick either. After reading your analogy i can see why it doesn’t work. Thank you so much for the information. Thanks Brian. Glad it didn’t hurt you. 🙂 Luckily Singulair is very specific to just, I believe, 1% of the asthmatics for whom it is essential. You are not among that few luckily. Thank you for the information! When I was switched to the generic form of Singulair a few years ago, I was sick for about four weeks until it dawned on me that maybe the generic form was not working for me. A few days after switching back to brand Singulair I was well again. It’s nice to see proof that I’m not crazy. My doctor has no problem prescribing brand-name for me, but getting my insurance companies to cover is a continuing issue. I often have to pay full price for it, and it’s quite expensive. You’re wonderful, Angela! Thank you for so much great information. I can completely understand your frustration with insurance companies. What the general public does not always realize is there is a Department of Insurance in every state that regulates all insurance companies. These companies have to fall within their guidelines or they can face swift action, heavy fines and even loss of license to operate in the state. There is a thing called unfair claims practice. It’s a very serious fine and punishment if caught breaking this regulation. If your doctor writes your insurance company stating that the generic form of the drug is not effective in treating you and has been tried with no result, they must pay for the drug within your policy limits (dollar amount of coverage for the year less deductible and copay). If they still refuse contact a claims manager within your insurance company and let them know that they have to pay for it or you will be contacting the department of insurance to file an unfair claims practice complaint. They hate these words! That should fix it. If not, Google your state department of insurance and contact them. They will have to reimburse you for all claims made after your doctor wrote the letter. If they approve ask the claims manager to note your file for any other claims in the future. A little work and stern words will save your pocket and you from get raked over the coals with these insurance companies. I hope this helps! Oh wow! What awesome information! Thanks Insurance Geek (love your chosen identity name)! Morning Angela, haven’t had my coffee yet so I may not sound intelligent. Our bodies have a lot Salt usu in the form of NaCl. I imagine Monttelukast will pick up the Na+ regardless because of strong affinity and our organs bathe in a pool rich with NaCl and other ionic compounds. However I would need to review the pharmacokinetics to explain fully. For some medications sodium Na represents extra salt load that can trigger heart failure the body retains H2O and high blood pressure. The problem with generics as you pointed out is bioavailability which has to do with structural changes of the generic. The dosages on generic are unpredictable and for some people generics just don’t work.. it is insurance companies that dictate what medications will be covered not the doctors in the trench. It does not Angela because the end that would pick the sodium up is tied down. In fact if you compare the two molecular graphs, you can see that the drug in the generic is completely different. The sodium is needed for it to delay the absorption until it passes the stomach. Without it the generic metabolizes without it being absorbed in the right place and so it does not work. Because so few people actually benefit from it, doctors cannot see its importance because 99% of asthmatics who get it and then stop it makes no difference so for them it makes no difference which they take. For the 1% that includes me, it sent me to a 1-year hell of scans with iodine, ENT endoscopy through my nose–not one I want to repeat and he had to do it twice! and many other tests–even had an MRI. I lost my voice, felt sicker than a dog for 10 months. And then I had an idea and took the brand name and in 2 days I was as good as new. Clearly there is a difference. By the way the same is now happening with another drug–this one for thyroid. A friend of mine has been on one for years. They changed it to generic and she has been off balance ever since Check out the two drugs chemical map: Thyroxine versus Levothyroxine. I try to put the picture here from the edit view in the background for ya but it may not work… I had to upload a link.. Hope this works. By the way Angela, the connection between salt and heart attack is all wrong. The heart cannot work without salt. There are now people who put their 3-year olds on low salt diet because it is better for their heart but forget that salt is required for the voltage to operate the neurons and all cells–even you forget! There is also a new study by UCI on old people in a senior center near San Diego. They have followed several thousand people for 30 years. 1500+ are now over 90 years old. They checked the difference between those who lived to be 90 and 100+ (some still walk 3-4 miles a day) and found that a higher BP is actually better. And I can explain why: low BP means less oxygen to organs and less blood to brain. High BP means too much. Higher than 120/80… make it 150/80 or so.. turns out to protect against aging brain and dementia. Take that home to the medical field. The research is by UCI. Check it out. I think we need to update our medical knowledge to be a bit more current in general. I was a Chemistry major and am familiar with organic chemistry. 🙂 Most doctors are aware that the bioavailability of generics differ from name brands– pharmacokinetics and pharmacodynamics altered unpredictably. As for how Singular or Monteluklast is absorbed, looking at the formulas that is not straight forward–it is metabolized in the liver not clear if active ingredient is Montelukast or Montelukast Sodium? Monteluklast decreases inflammation by stabilizing mast cells and eosinophils. The medication does not work acutely and takes time. Patients commonly complain it does not work and it maybe ineffective for patients whose asthma does not involve certain inflammmatory cells or are not IgE mediated. Also it may take weeks to work. I mentioned sodium to point out some medications with heavy salt loads can cause deterioration HTN and CHF. I learned many things from medicine, one applies now. We are different and respond to medications differently. Each 10-mg film-coated SINGULAIR tablet contains 10.4 mg montelukast sodium, which is equivalent to 10 mg of montelukast, and the following inactive ingredients: microcrystalline cellulose, lactose monohydrate, croscarmellose sodium, hydroxypropyl cellulose, and magnesium stearate. Thanks Angela. I found the same. I also know that given the number of people with asthma for whom this drug does nothing, having them take the Montelukast or Montelukast Sodium will not make any more difference than not taking the drug at all. Thus the statement you quoted above is incorrect. This is saying that Aleve is the same as aspirin. Croscarmellose sodium is a food emulsifier–like a meat tenderizer. This is under no condition equivalent to Na+ that is attached to the original drug. For those to whom this drug is essential, the 1% of asthmatics, the lack of that little sodium ion makes the difference between health or illness. I was ill for 10 months on the generic Montelukast and 2 pills of the Montelukast Sodium cured me in 2 days. This alone is proof that the Na+ has a role other than just taking a pinch of salt. I am not asking for the brand name; I am asking for an equivalent generic–there are plenty out there. I can get mine at Costco for damned $15 a month! Why can’t Kaiser provide the same for me? It is probably 10 cents more expensive for them than just Montelukast. Knowing that the two drugs are not the same is “harming with intent” in the eyes of the law. Rest assured it will not go down the tube without a fight–legal or otherwise! Btw, I wonder if the general mishpokhe’s neo-cortex is capable to understand there’s a difference between Ca, K, and Na. Add – or + to an element, et voilà, even more foggy brains will be the result. And I won’t even ask if they would know what H2O stands for. lol Roald, probably not. But I do and that’s enough. I took a letter to my esteemed secret doctor who cannot be reached by phone or fax and is not in any books–probably for protection from people like me since he cluelessly gives rights or denies rights to the correct medication. So today I went armed with a letter to him and asked the pharmacy to kindly send it to him by internal mail. Why? So he cannot say he did not know… this way it is now a crime! Tada! He may not know the difference between Ca, K, and Na and what they do in ionic form–in fact I had people tell me that sodium is better than table salt.. lol.. I asked them at what time they would like to blow the chem lab up with sodium? Since it is explosive.. they haven’t the clue. I do not expect common people to know.. but I DO have expectations from my doctors and they MUST know.. else I will sue their pants off… that simple! I also had to contact the FDA.. they too had Montelukast as the generic for Montelukast Sodium.. and used the chemical chart for Montelukast Sodium and the brand name Singulair… Luckily for them they updated immediately. Monday I will fight the NIH since they too got it wrong and then I am calling Merk, the company making Singular and bring this to their attention that their brand name is bastardized by clueless people who put a drug not even close to being equivalent on their name as equivalent! Singular is their brand name as is their ingredient! they must stand up else their fight is lost and any form of Singular is a waste of time to produce since everyone will be switched to the $10 Montelukast… I also had a fight with Wikipedia yesterday… they also got it wrong. They are not willing to change it until it is changed anywhere else because even they are clueless. Trying to let them see that this will backfire in their own front yard if things are left as they are, is the right approach! Placing explosives in different, even opposing yards, is a sublime strategy as well, especially when they’re ignited by an insider. Add to this that you just love to put firecrackers in dry assholes, I can only confess: I’m proud of you. Well….um….this time, eh?